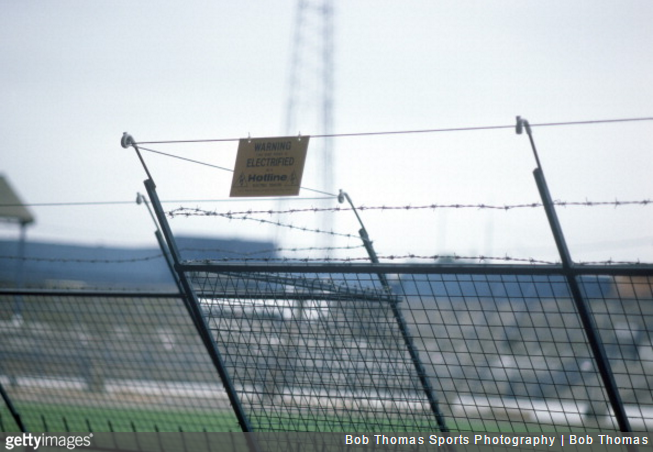 The Chelsea-Tottenham fixture at Stamford Bridge on 27th April 1985 threatened to boast an even more electrifying atmosphere than usual, right up until the point that the Greater London Council (GLC) stepped in with a bit of timely common sense. Following a hectic pitch invasion at the ground the previous month, beloved Chelsea chairman Ken Bates decided – in his inimitable style – to get tough on the oiks responsible. Bates pressed ahead and installed a 12-foot high, barbed electric fence all around the pitch to pen in the fans and keep them in check. The 12-volt barrier was due to be switched on at the home game against Spurs – a suitably low-key, low-intensity fixture to test such a measure out. Bates milked the publicity parading his hard-line credentials but, days before the switch was due to be flicked, the GLC stepped in threatening legal action. The fence was never switched on.